Around 20 years ago, we did an interview with Nariyama Tetsuro Sensei. Do you know him? Yes, he was in Osaka. He was also on both sides. He was with Tomiki Sensei and Kobayashi Sensei. He worked with both. He was in between the two. Kobayashi Sensei liked him, at one point. I think from 1980 Nariyama leaned toward Tomiki Sensei and took a little more distance from Kobayashi Sensei. Up until then, he was really on one side and the other. Apparently he was in the circle of Kobayashi Sensei’s more advanced… What Nariyama Sensei said is Kobayashi Sensei complained because Tomiki Sensei added competition in aikido. Yes, he couldn’t bear the idea of competition. He said that it didn’t make sense. 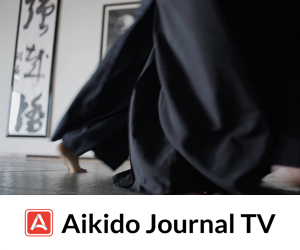 He upheld the idea that aikido was a traditional budo, and in budo there is no competition. It was unbearable to him, but he truly respected Tomiki Sensei. It seems that he arranged for Tomiki Sensei to present his theories during a conference for college students. I was very surprised. Yes, I don’t have precise information about the conference, but I know he really helped Tomiki Sensei introduce his style in the universities. That was really his spirit. 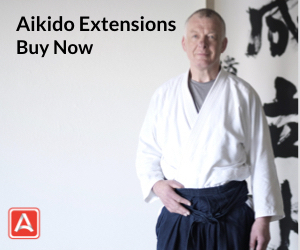 He’d say, “Every style should be entitled to exist.” He was willing to help anyone as long as they said they practiced aikido and O-Sensei was their reference. I know he helped him. I saw some Japanese teachers several times, I can’t remember their names… We’d go to Shodoshima where there was a dojo in a small minshuku, ryokan. The innkeeper’s name was Masuda san. When you’re in Shodoshima, and you get to Tonosho, there is a famous statue of liberty with children. In the street that runs parallel to the port, there was an inn. We’d go there. There was a small dojo in it. And there was another dojo on the hill. It was the innkeeper, Masuda san, who gave us access to that old dojo. We met two groups there a few times, a Kobayashi Aikido university group and a group that practiced Tomiki Ryu. In the evening we ate with the Tomiki Ryu master, it was cordial, very friendly. I went to a few classes of these masters to see, understand what they were doing. Did you ever meet Tomiki Sensei? Kobayashi Sensei first went to Europe in 1973? No, the first time he went to Europe was in 1964. It seems he went to Europe at the request of O-Sensei. 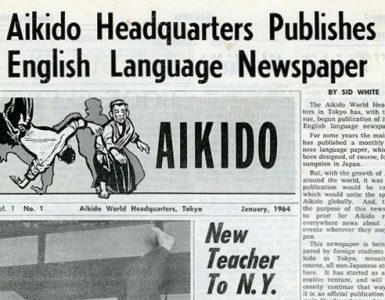 To tour and see where the development of aikido stood. His first seminar was at Mayerling in Switzerland. It was mainly Interpol people even if there were some dojos involved, it was mainly the police. I know he met Tamura Sensei with whom he was very friendly. They were very close. I think he also went to Annecy, where there was Nakazano Sensei and Noro Sensei, he saw them there. He also saw Noro Sensei in Paris. He went to see Mister Naessens in Brussels. Noro Sensei often went to see Naessens in Brussels. Then there was O-Sensei’s death. He came back in 1971. When he started going there regularly did he meet other Japanese masters living in Europe? Yes, he would meet with Tamura Sensei, for instance. I was with him when he gave seminars to Tamura Sensei’s students. Tamura Sensei would invite him and he’d give the course to Tamura Sensei’s alumni. Did he consider him as a senpai? Tamura Sensei? Yes, Tamura Sensei considered Kobayashi Sensei as his senpai. He showed him friendship, and a lot of respect. The relationship was very clear. Up, down. Tamura Sensei was a charming man, very nice and with Kobayashi Sensei he was great. 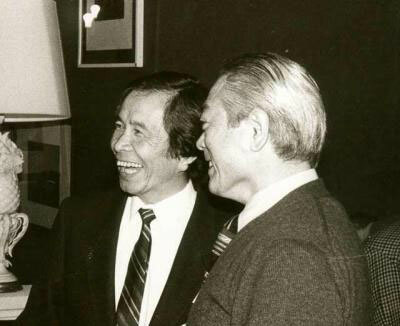 In 1984, when I opened a dojo in Lyon, we organized a seminar with Kobayashi Sensei. I invited Tamura Sensei for the celebration. He agreed and came immediately. They spent evenings laughing and talking. It was very friendly, very warm hearted. It was a beautiful relationship, a relationship of true friendship. And in Italy for example, was Tada Sensei still there? At the beginning Tada Sensei was still there. I don’t know if he met him in Italy. There was a practitioner in Italy, Mr. Kawamukai. He did some aikido in college. He wasn’t a great expert. He had practiced very little. He came to Italy… it was for his father’s work essentially. That’s why he came. 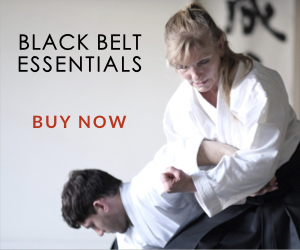 He opened a few Kobayashi style Aikido classes and that’s how Kobayashi Aikido began in Italy. Essentially Milan. There was Mr. Filippini. Did you ever hear that name? Giovanni Filippini had a dojo in Segrate, the suburbs of Milan. He had made requests for seminars. That’s how it started. Kobayashi Sensei held Tada Sensei in high esteem, very high. Saying he was very upright, a real Gishi, a righteous man. He greatly admired him for his integrity and his loyalty. It was someone he referred to in a very positive way. There were some people like that, whose names I often heard him say, I think I’ve mentioned them all. He went to Osaka in 1954. He moved to Osaka. So if he was in Tokyo, he might have learned a lot from Kisshomaru Sensei and Tohei Sensei. He always spoke of Tohei Sensei. He found Kisshomaru Sensei’s aikido uninteresting. I would assume that he studied something in Tokyo during that time. Maybe he knew Nishio Sensei. Nishio Sensei of aikido, who was a karateka as well? Yes, of course. Did he have contacts with other aikido Shihan? Was he close to any of the members of the group in Tokyo? I do not know. With me, he always mentioned the same ones. The people he appreciated were Tohei Sensei, Yamaguchi Sensei, though he did not like his style, but he thought he was a good person and his aikido was interesting because he was mobile and flexible. He loved Tadashi Abe, that’s certain, Saito Sensei because he was righteous, strict and rigorous. But who were the people with whom he had a friendship? I know Kuniba Sensei from karate; he lived in California, and was also O-Sensei’s student at a time. I met Kuniba Sensei in France. At the time there was a very good karate practitioner in France. His name was Patrick Tamburini. He was a disciple of Kuniba Sensei. One day, Kobayashi Sensei and I were in St. Etienne and he told me that Kuniba Sensei was coming. Kobayashi Sensei said: “He’s really my friend, you’ll go and see him, you’ll go and talk to him.” So I went to meet Kuniba Sensei and immediately he asked me if I could translate his class because no one else could. And then we went to eat together. When I told him that I was a student of Kobayashi Sensei, he cried. He said that Kobayashi Sensei was his friend. “We’d ride our motorbikes together, we liked the same girls. We got into all sorts of mischief together.” He was a remarkable man. At the end of Kobayashi Sensei’s life, he knew he was going to die, didn’t he? Yes. In any case, he spoke to me about it directly. I think I read it in an interview. 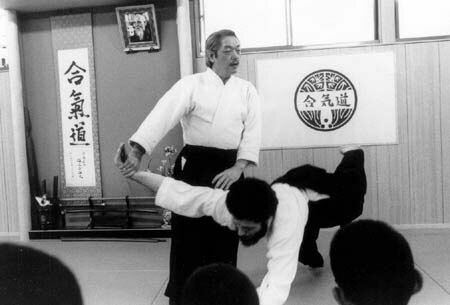 He created mechanisms so that his aikido and this tradition continued in the future. This is very interesting. Can you explain a little? It was too late and for him the Doshu should have been Tohei Sensei. He even went so far as to tell me that O-Sensei had told him so, but then there had been disputes, things that made it impossible for it to be Tohei Sensei. And so he said: “I do not want to do the same thing. So I want to think about it beforehand.” And I think the structure he put in place coincides exactly with his experience. 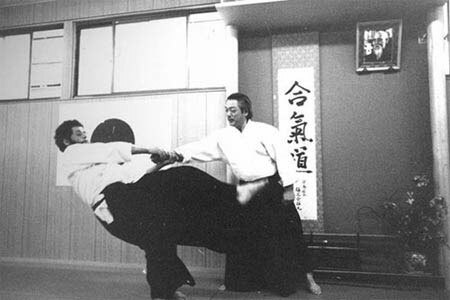 In Japan, there is the Buikukai with people like Yabuchi Sensei, Kimura Sensei. They are there and they are maintaining the Buikukai in Osaka and developing it. 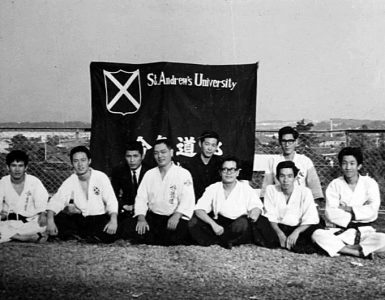 Then there is our organization that Kobayashi Sensei was a part of – Kokusai Aikido Kenshukai Kobayashi Hirokazu Ryu Ha. He created this organization and immediately entrusted me with its leadership. Its creation was formalized in 1998 because he had said, “we must wait and we must not do it too soon.” He did not want to have too many problems, a backlash. It was not until almost the last moment, in 1998, that we made it official. 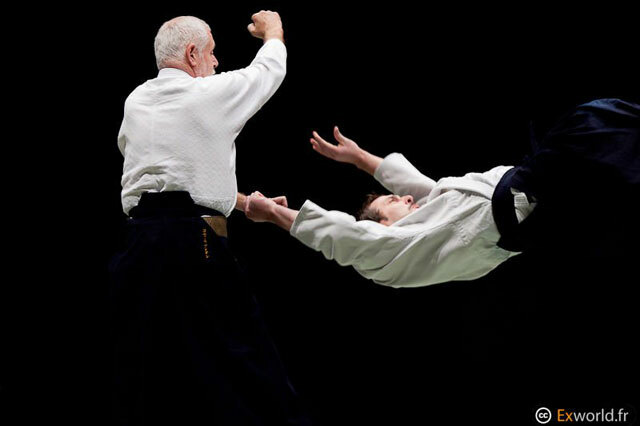 When it was formalized he said, “I do not want to be the Saiko Shihan (highest-ranking instructor), you will be the Saiko Shihan.” We said: “So what is your place?” We proposed Soshu because if we had proposed the idea to Doshu it could have been misinterpreted and created tensions. He agreed. At the inception there were 7 of us. Salvadego Shihan – my student in Italy; Jean-Pierre Giraud from Lyon who was a student of mine who lived in Japan and was very close to Sensei in Japan; Frédéric Huet, who is one of my oldest students and who currently lives in Indonesia, and is in charge of the Indonesian group; Walter Oeschläger a German from Stuttgart who was close to Sensei. He was really good friends with Sensei. He would go to his house; it was very cordial, very friendly; and André Macario who is one of my oldest students. He has been following me since 1976. I think that’s it; I was the last one. We officially met for the first time in November 1997 and in January 1998 to clarify things. We met again in April to review everything we had planned. Sensei designed the crest. 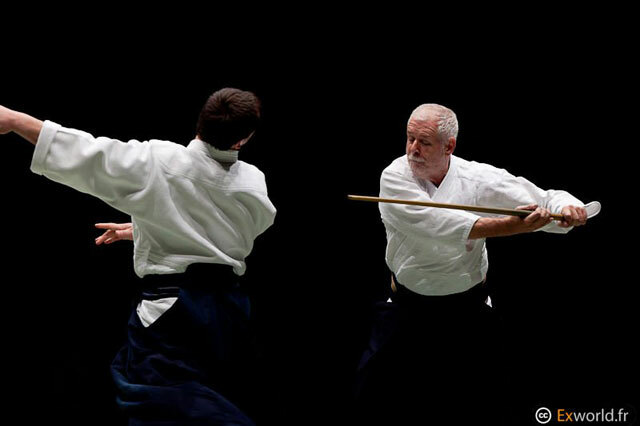 He used the same red cross he had used in Osaka – with “Kokusai Aikido Kenshukai”, “Kenshukai” so as not to be in opposition with the Aikikai and because in Kenshukai there is an idea of research. Were the official documents created in French, but also in Japanese? And were there other languages, German? No, it is not translated into German, but it was agreed from the outset that there were two official languages, French and Japanese. For us it is a complex position because we are implicitly challenged by certain people in the Buikukai and at the same time we are implicitly recognized because they know perfectly well who I am. They don’t contest my position with Kobayashi Sensei, so it is a bit ambiguous. Yes, he had a wife and five children. He had four daughters. I say had because one died young – she died when she was still a teenager. The first is named Kimako, she lives in Belgium. Eriko his second daughter died prematurely. She died quite young, she was 15 or 16 years old. Usako still lives in Osaka, I see her regularly, she remained close to her mother until her death. Mrs. Kobayashi died last December. I saw her just before. I went to see her at the right time, she died a few days later. Usako has two daughters, Chihiro, who looks like her grandfather and Nao. 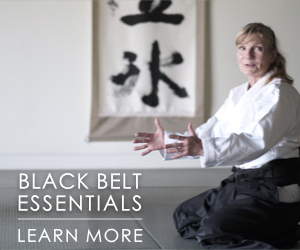 Usako and her daughter Chihiro have been regularly practicing aikido for years. Then there was his son Kazuo, who never practiced aikido, and his last daughter Tomomi. She practiced aikido when she was in college. She came to France with her father, and Europe. Now she is married. Do you think you have enough information to write a biography? No, I couldn’t. I do not think I have the means to do the research or the time. When I write, I write at night. In hotels, on airplanes, because I’m constantly working. I travel all the time. Today, I’m here, tomorrow I’m going home, the next day I am going to Italy, and then I go back to France to train teachers. Then I’ll go to London, where we have a meeting with the Dai Nippon Butokukai. I go home for two weeks, and then I’m leaving for Japan. When I return from Japan, I come back on a Thursday, Friday I have a seminar in Germany. The next week I have a course in Moscow and in between I am in Kiev. Early December I return to Japan. Early January I’m in India. It never stops, in April, I’ll be in Japan again. I go to Japan 3 or 4 times a year. I also come back to the United States in January. I’m always on the move, always. And when I’m in France, I also teach. So we have constant activity. I made the commitment to develop Kobayashi Sensei’s aikido. I’m keeping it, I’m trying to keep it alive. 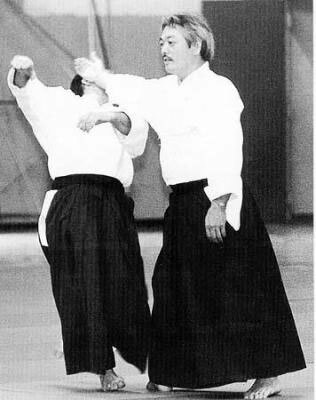 In 2013 Nariyama Sensei released a series of letters in a short book between himself and Tomiki Shihan, which pointed out that Tomiki Shihan instructed Nariyama Sensei to train under Kobayashi and that he had laid the groundwork for this to occur. This is slightly different to the idea of Nariyama being positioned between the two Shihans. It was actually a collaborative effort to support Nariyama Sensei. The letters were gifts to all who attended the 2013 Taikai in Osaka. My own Sensei in Australia also trained with Kobayashi and he has told me that Kobayashi Shihan is/was seen as a friend of what Tomiki Shihan was setting up, despite his reluctance to support competition.